SAL DeTRAGLIA'S VIRTUAL TAPAS BAR: A SHORT PRIMER ON COCIDO. I’ve been cruising “chicks” lately. Chickpeas, that is. It’s not hard to do in Spain and unlike cruising the other kind of chicks, no hair mousse is required. Chickpeas are typically associated with the cuisines of India and the Middle East, but feature prominently in many Spanish dishes as well. And of those dishes, none is more important or ubiquitous than Spain’s famous Cocido. Cocido is, in essence, a boiled-in-one-pot meal. Chickpeas (a.k.a., garbanzos), chicken, chorizo sausage, fatback, beef hunks, turnips, potatoes, cabbage, carrots, leeks and various other ingredients (depending on where and by whom it is made) are simmered in a large pot for hours. The meats and vegetables are removed and set aside, and short noodles resembling broken pieces of thin spaghetti are boiled in the broth until softened. The meal is then assembled. The broth and noodles are served as the first course. Second course consists of the boiled meats and vegetables, which are arranged on each person’s plate in neat little segregated piles. A Cocido meal is typically accompanied by long, thin, pickled guindilla peppers, crusty bread and a glass (sorry…glasses) of red wine. Cocido tastes good, of course, but its immense popularity in Spain is also due to practical reasons. Home cooks love it because its preparation is relatively easy and hands-off. Just toss in whichever meats or vegetables happen to be in your pantry at the time, then sit on the couch and immerse yourself in the intellectual rigors of Hola magazine for the next couple of hours. Cocido can also be economical. My mother-in-law informs that her mother religiously made it once per week because – if the meats were avoided or minimized – it was a cheap way to feed the family during those lean years under Spain’s dictatorship. Of course, historical integrity is often lost on restaurateurs – particularly those located elsewhere. I once ordered a pricey Cocido at an “upscale” Spanish restaurant in Chicago, and it came loaded with duck. No offense to the chef (who obviously put a lot of thought into unnecessarily modernizing this classic dish), but I don’t want any waiter to hand me a plate of duck unless it is accompanied by chopsticks and a fortune cookie. Tasty. Relatively inexpensive. And 100% duck-free. 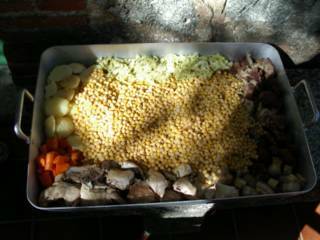 Yes, my mom used to make cocido every Monday on wintertime mainly because it was the perfect day to do the washing up (by hand on a wooden board, no washing machine at the time)without being worried about any other chores since the cocido was boiling on the fire for three or four hours. In the old times the cocido was called "cocido de tres vuelcos" (I´m unable to translate this into English)meaning that it was served in three steps. First the broth and the noodles, second the vegetables and last but not least the meat. Today meat and vegetables are mixed. It is served and prepared in different ways all over Spain with different names : For example, in Catalonia it is called "Escudella i carn d´olla" (I hope the spelling is correct). A good book to learn some old times recipes is oh surprise! Don Quijote de la Mancha by Cervantes.There you can find the "duelos y quebrantos" favorite dish of D. Quijote.and many others. My andaluza abuela Concha, a great cook, made the andalusian version of cocido: they poured onto the garbanzos a delicious home made "salsa de tomate" hierbabuena (mint?)flavour. The economy of cocido comes also from the leftovers: "ropa vieja" (old clothes)with the meat, and garbanzos fritos (fried chickpeas). Now I know what we'll be eating for our Thanksgiving dinner. Here is Catalonia speaking. Escudella i carn d'olla is perfectly spelt. It is true that this is another kind of this boiled meals with meat and pulses (legumbres?). The escudella is in fact the result of boiling anything a farmer may have available. Some chikpeas (not so many as for the cocido, as for the madrilenos the garbanzos are the most important part), noddles, rice, vegetables and different kinds of meat (chicken, pork and/or beef) and the pilota. The pilota (=the ball) is a big meatball and the most important part for catalans. The pilota and the rest of the boiled meat are the carn d'olla = meat of the pot, and used to be the main course in old times. But now it is different. For Christmas we eat a soup as starter, the pilota as second starter and then, when you are full, you get as main course a huge leg of turkey which you are not able to eat. Then most of the turkey stays on the plate and can be used for next day (Second Christmas Day = Sant Esteve = Saint Stephan. On that Day Catalans cook Canelons de Sant Esteve = Saint Stepahn Caneloni. But this is another story (for Sal's Christmas Edition).